A Rafting trip with Beyond Limits is the perfect Company Event! Get a quote for your group trip! Rafting with Beyond Limits Adventures is one of the best group activities in California. In 33 years we've seen it... and done it all. We can customize our trips for any type of group that you can put together and Company Trips are our Specialty! Private Charter Trip - If you have 12 or more persons we will run your trip with just your folks. No added persons will ride with your group. Meals - Our trips feature fresh and delicious food. If you have a special request for your corporate event we are happy to make changes to our menu. Let us know what you have in mind! Resort Grounds - We have the nicest facility on the American River for corporate events . If you need a private place to host your meeting we can set it up for you in a beautiful riverfront setting. 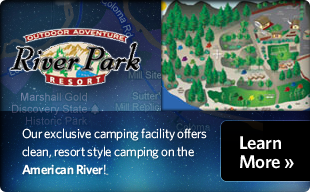 Location - River Park Resort (our meeting area) is located within an easy drive from Sacramento and the Bay Area. We can arrange Bus transportation for your group and our Parking Area is fully accessible for charter buses. Day Trips - Our location makes a great day excursion for your company outing. You can depart from the Bay Area in the morning, eat lunch when you arrive, raft and be home by evening. Trip Photos - We have a kayak photographer who paddles with every trip. After the trip you can view and purchase a cd or flash drive of all your exciting shots! We also let you bring your own GoPro cameras on our trips. Cold Beverages - Our outdoor bar serves cold beer on tap and other refreshing beverages. What a great way to end your river adventure! Modern Restrooms - Our restrooms, hot showers and dressing rooms let you switch from business attire to river attire! Your group will have full access to our clean and convenient facilities during your trip. And Above All - FUN! No other activity in California allows everyone (regardless of skills) to have such an great adventure as a group. Our trips are the perfect Team Building experience! Check availability - You can do this online by checking out our trip calendar. Select the date, trip and number of persons to see the price and find out if we have the space available. Our group rates will be applied automatically to the price. You may also click on the trip from our left navigation panel and then click the "Make Reservation Now" link or you can fill out our "request a quote" form to have one of our sales representatives contact you shortly! Payment - You can pay online to immediately confirm your reservation with any major credit card. It's easy and secure! Or, if you are just in the planning stages of your trip, Request a Quote and we will email you a special rate along with trip information and a Group code. Each participant in your group can then book online and receive the discounted rate. With Beyond Limits you can easily organize a group trip without the hassle of collecting payment from all of your friends! Go Rafting! After the payments have been made, you are ready to go rafting! Make sure that everyone in your group knows the trip details prior to driving to our meeting place.